Turkey's rotten fundamentals have not improved one bit since last year's massive sell-off in the Lira, which threatened the viability of the Turkish economy as a whole. The Lira has been steadily weakening since the start of the year, and Erdogan has been at his autocratic best in trying to stem weakness in the Lira again. Watch Turkey closely, as I believe last year's saga is about the repeat itself again. As the markets celebrate improved trade relations between the United States and China, equities around the world have powered higher. At this juncture, it is important to reassess one of the situations which gravely worried investors in 2018 - Turkey. In the middle of last year, Turkey saw a steep depreciation of its currency, one that threatened the viability of some of its banks as the USD hit all-time highs of around 7.00 against the lira. Goldman Sachs had warned that every 10% drop in the lira would reduce the capital levels of Turkish banks by 50bps on average. Since then, a combination of bold rate hikes by the Central Bank of the Republic of Turkey (CBRT) coupled with a relaxation of the US Federal Reserve's relentless rate hike trajectory have eased the pressure on the lira. All fine and dandy then? Well, the lira has been creeping higher since the start of 2019, a development that has largely evaded the mainstream media and the investing community, at least till late March when Erdogan was at his autocratic best when he prevented local banks from lending lira to foreigners to stem lira weakness prior to key local elections. The move effectively eliminated lira liquidity in the market, and caused the overnight forward implied yield on the Turkish lira to shoot to as high as 300% annualized. This means that an investor would have to pay close to 1% on the notional of his short lira position if held overnight. After the conclusion of local elections, the overnight forward implied yield on the lira has since normalized back to pre-election levels with liquidity restored to the markets. However, this move was akin to employing capital controls to prevent lira weakness. There were rumors that locals have been trying to switch their lira holdings for Euros or Dollars, which have contributed to weakness in the currency. If anything, this development should sound off alarm bells in those who are invested in Turkey. How would institutions be able to hedge lira-denominated debt if Erdogan pulls off a similar stunt again? Who would want to invest in Turkey when even the locals do not want to hold their local currency? This is a problem for Turkey, which relies heavily on foreign capital. 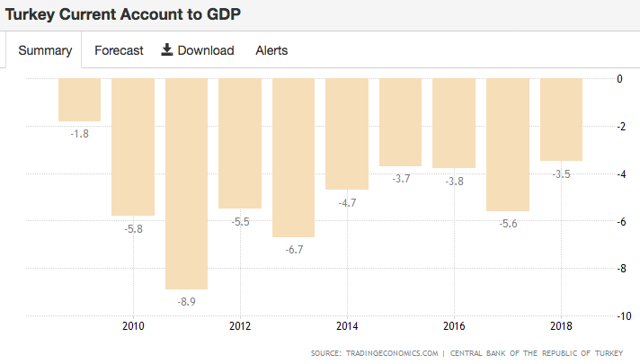 The country has been consistently running current account deficits (currently -3.5% of GDP) for the past decade, which is a clear sign that the economy is not competitive enough. 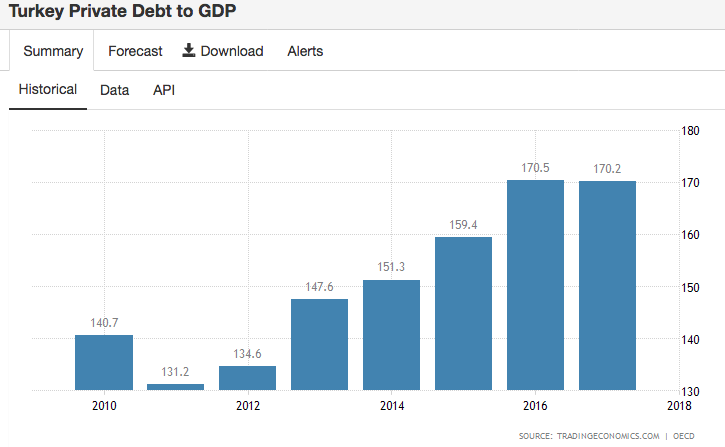 Turkey's private debt to GDP is at a startling 170%, which reflects the fragility of the economy. 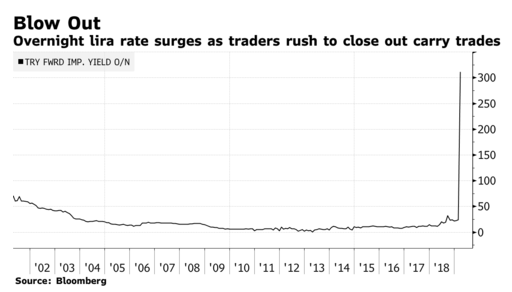 Last year's sell-off in the lira led to fears that Turkish businesses would be unable to pay off foreign-denominated debt, and this ugly specter could raise its head again if the lira continues to weaken to reflect the country's poor fundamentals. Turkey remains trapped in an unenviable position. How can the central bank continue to raise interest rates to fight off inflation (close to 20% year-on-year) if that would directly raise borrowing costs for businesses to refinance their steep levels of debt? If interest rates are not raised to an attractive enough level above inflation, why would foreign investors choose to invest in Turkey and lend to Turkish businesses? Already in March, there were signs that Erdogan's government has been acting to stem lira weakness, and I am certain that the lira continues to live on borrowed time. Close to half a year has passed since USD/TRY rocketed to all-time highs above 7.00, and nothing has changed for the country's rotten fundamentals. Watch developments in Turkey closely, as last year's capital flight from Turkey led to weakness in the Emerging Market (EEM) complex as a whole. There is good probability the same saga might ensue again.